You know I have a few little tricks to boost up the flavor of your Pico de Gallo, even when good tomatoes are out of season. The tomato, though, is what really makes any Pico shine and if you can’t get at least a halfway decent tomato, you might want to think about using a jarred salsa, instead. All the little tricks in the world won’t make a good Pico out of a lackluster tomato. But let’s be positive thinkers here~let’s say we have a great tomato! And let’s say we have a great knife to cut them with, coz you’re going to want to keep the slices as uniform as possible. I like to slice, then give the tomato slices a little squish and a rub with my fingers to remove the excess seeds, any unattractive hard parts and I work over a bowl to catch those excess juices. Then I dice the tomatoes up. If they’re really juicy, I let the tomatoes sit in a strainer for a few minutes. I like to get the watery tomato juice out of the way so there’s more room for bigger flavors, like the lime and garlic. When my Pico is done, I taste and add more salt if needed. optional flavor boosters: a pinch or two of sugar and a drizzle of red wine or apple cider vinegar. Gently toss tomatoes, onion, jalapeños, garlic, cilantro, and lime juice in a small bowl; season with salt to taste. If the salsa is somewhat lackluster, add a pinch or two of sugar and a small drizzle of the vinegar. Let sit at room temperature for up to an hour (or as long as you can wait) to blend the flavors, then store in the refrigerator. This entry was posted in Click here for Fabulous Food Posts and tagged Appetizer, Condiments, Hot Peppers, Jalapeno, Lime, Mexican or Southwestern, pico de gallo, Spreads and Dips, Tomatoes. Bookmark the permalink. This is a classic Mollie! And we do have tomato plants in the side yard– Pico de Gallo in our future!! thanks! What’cha doing for Mothers Day? Hope it’s a good one! Believe it or not, we’re not sure! Planting flowers for one! Hope you have a great Mother’s Day! It was very vibrant…I was lucky to find such good tomatoes this time of year! Before I started my blog, I never knew that there is a name for this or this mixture really existed. I thought it was just a mixture made by my Mom and aunts, We use to eat this one with fried fish and rice. 😀 Sounds weird? Haha! 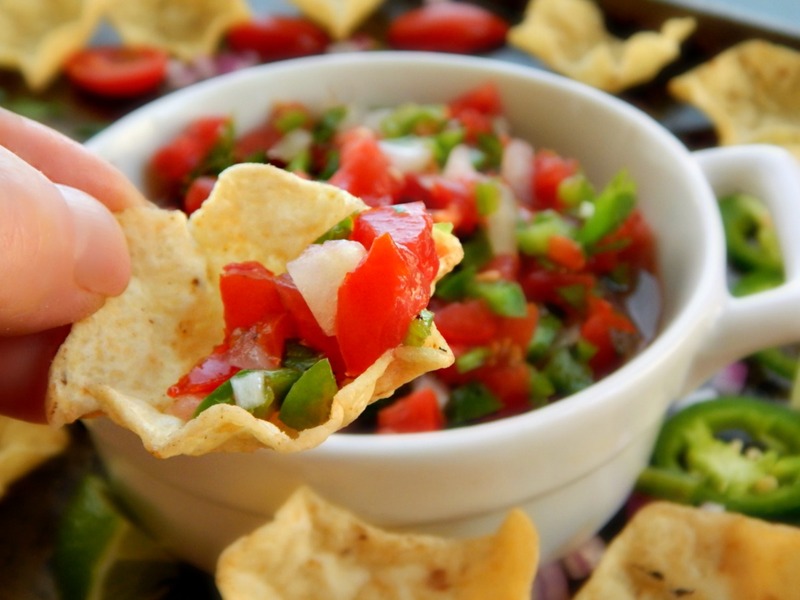 Pico de Gallo is a classic thing, but never gets old. I love the addition of vinegar, just like what my aunts did. I hope you are well, Mollie & enjoy the rest of your weekend! See, smart aunts! You must come from a family of cooks – is that how you got your love of it? Isn’t it funny how Pico de Gallo never gets the limelight? I have mine as an “aside” recipe on two of my posts, but never as a stand alone. Good for you to put it out there on its own, like it deserves! You can never have too many pico de gallo recipes!